Well it sure was nice to be home for the holidays, too nice in fact. Leaving home gets harder each time and so very soon all my travels will be purely in my control rather than an emailed itinerary. In the mean time, the new SDS30 SuperSubs did their first show. A 16 box set up with 8 on each side in cardioid arrays. I kept them very tame for the show as the last thing I want is to overwhelm or distract from the primary goal of connecting the artist with audience. Over the course of this leg I will slowly open them up in both level and bandwidth doing my best to only make forward steps. A few aspects of the sound were readily apparent. First is that these subs go low, really low, in fact so low that I had to high pass them as not to overwhelm with frequencies below 30hz. Definitely will need to develop some techniques to manage and harness the extra energy. Secondly, they are fast, like hard hitting punchy fast. At first this punchy fast sound threw me off and I will need to refine managing that as well. The kick jumps out in ways I have not heard since mixing on horn loaded subs yet without the low frequency limitations and pesky sound peaks that plague those horn designs. Also the box resonance is so low that either I high-passed above it or its so subdued that it’s a non issue. Beyond messing with the high and low pass filters, I used no external EQ. Typically dialing in sub EQ is one of the more challenging aspects I face in tuning a system. All that said I wisdom of years of building and testing new systems tells me that initial impressions rarely tell the whole story for better or worse. 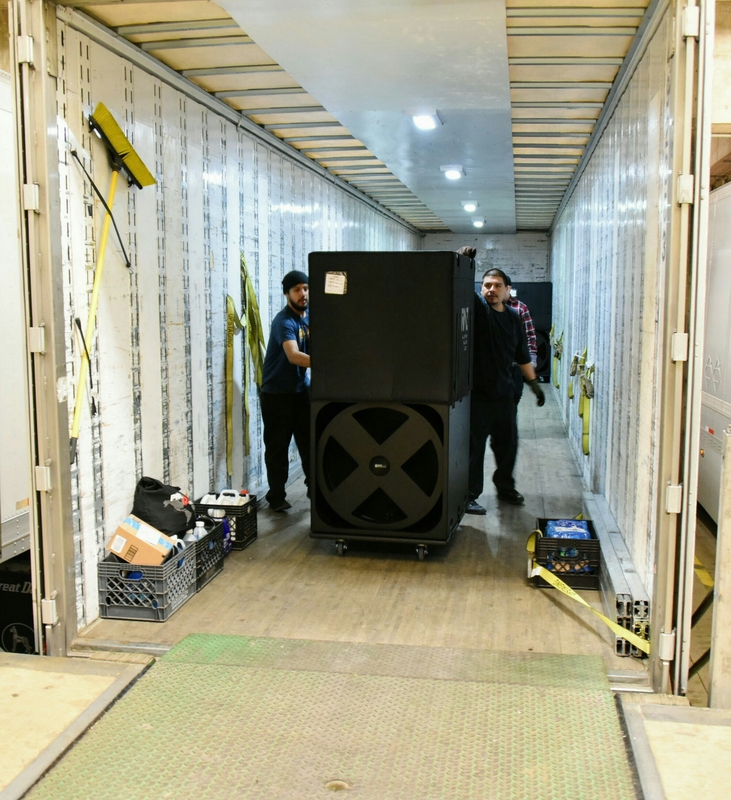 It was a busy day and had a lot going on and spaced grabbing pics of the arrays but here they are coming off the truck. Specs and more details soon. If you want us to email you info as it comes out, he is a link to give us your info. Cool cool and fun with big loud toys!